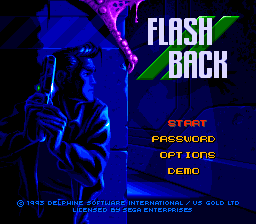 Flashback (フラッシュバック), known in the US as Flashback: The Quest for Identity, is a platform-action game for the Commodore Amiga developed by Delphine Software International and published by U.S. Gold in 1992. Arguably Delphine Software's greatest work, it has been ported to a variety of platforms, including the Sega Mega Drive and Sega Mega-CD, as well as 3DO, Acorn Archimedes, Atari Jaguar, CD-i, IBM PC, FM Towns, iPhone OS, Mac OS, PC-9801, and Super NES. CD-based versions tend to include full motion video cutscenes and an enhanced music soundtrack, but are essentially the same game. In Flashback the player controls Conrad B. Hart, who having escaped from aliens finds himself in the jungles of Titan with his memory erased. He must recover his memory and save earth from an alien attack. The game is largely inspired by Prince of Persia, though has many notable improvements such as a weapon system. The game was well received due to its fluid animations and stealth-like gameplay. The Sega versions of the game have one notable difference than other versions - Conrad wears a white shirt, presumably due to a more limited on-screen color palette. The Secret Base of "Paradise"
The game was followed by a 3D sequel, Fade to Black, a PC and PlayStation exclusive which was also intended for release on the Sega Saturn and was released for Dreamcast in 2018 as Fade to Black: Flashback 2. Plans for a third game in the series called Flashback Legends was due for the Game Boy Advance, but was cancelled. Leaked prototypes show a significant amount of graphical and story changes that barely resemble the world built up in the previous titles. A remake of the game developed by VectorCell was released in 2013. JoshProd released a new version for the Sega Dreamcast in 2017. Special Credits to...: Cross Products for the SNASM development system., Sega of America for GEMS sound tool. Music digitally recorded and mixed at: DELPHINE Studios, PARIS. NEC Retro has more information related to Flashback.